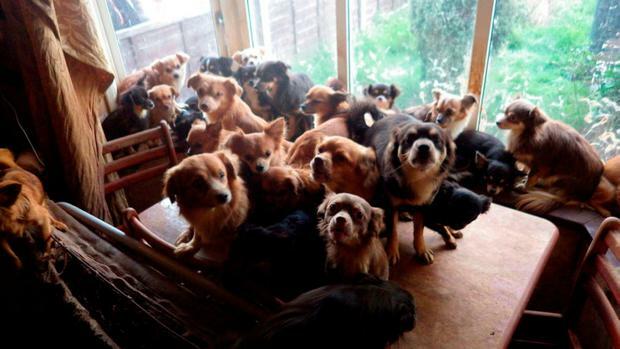 An RSPCA officer in the UK was shocked to discover 82 chihuahuas at a house in Birmingham. They told her there were approximately 30 dogs which needed care, but on arrival at the home, Ms Boal discovered the real number. She said: "They literally started appearing from everywhere. We would move the washing machine and suddenly there'd be six faces looking at you. It was incredible where they were able to hide. After advice from a vet to remove the dogs, Ms Boal and colleagues worked through the night to transport them to the Newbrook Farm Animal Hospital. Some had matted fur and fleas, others had burns. Ms Boal worked with the husband of the deceased woman to clear out the home and make it habitable for himself and dogs again. She said it was clear he was dedicated to the animals' welfare, but the issue was a lack of neutering. Ms Boal said the woman and her husband had started out with two pet chihuahuas - Blue and Tinkerbell. "Unfortunately, they didn't get their dogs neutered and four years later, they had 82 dogs!" Four dogs were returned to the husband, and the other 78 rehomed. "Two of the dogs that went back to (the husband) had serious behavioural issues and were extremely aggressive and unhappy," she said. "We were seriously considering our options with them because they were completely unhandleable. But when we returned them to him they were like different dogs and were so much happier." - The Dog Rescuers - returning to Channel 5 for a sixth series - is airing the story to promote the RSPCA's message to neuter pets in order to avoid unwanted litters.